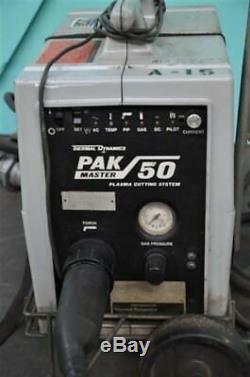 USED THERMAL DYNAMICS MASTER PAK 50 PLASMA CUTTING SYSTEM INVENTORY # 3750 MODEL: MASTER PAK 50 S/N M32B35A186401B. 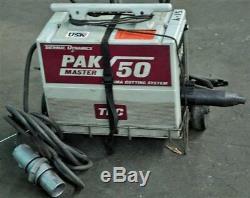 READ THE THERMAL DYNAMICS MASTER PAK 50 PDF HERE. 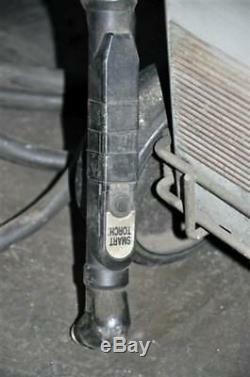 SPECIFICATIONS: PCH/M-75 TORCH: 90° CUTTING CAPACITY: 1/2 AMPS: 1 PH. Powered by SixBit's eCommerce Solution. 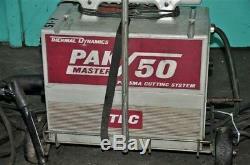 The item "THERMAL DYNAMICS MASTER PAK 50 PLASMA CUTTING SYSTEM 1/2 CAPACITY, 90° TORCH" is in sale since Monday, July 25, 2016. 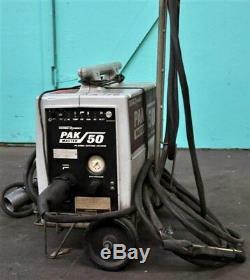 This item is in the category "Business & Industrial\CNC, Metalworking & Manufacturing\Welding & Soldering Equipment\Welding\Welders, Cutters & Torches\Plasma Cutter Torches & Bodies". 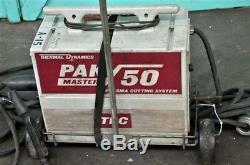 The seller is "machineshopdeals" and is located in Baltimore, Maryland. This item can be shipped to United States.